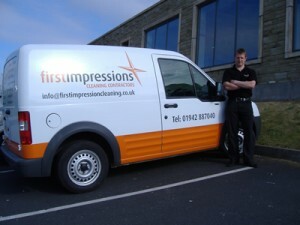 First Impressions Contract Cleaning is a privately owned cleaning business based in Bolton, Lancs. Owner Chris Kay bought the business in 2006 as going concern. Originally from an agricultural background Chris quickly familiarised himself with the cleaning industry generally and his new clients specifically. He soon realised that he needed a constant source of new leads and business development activity to grow the business and replace those contracts coming to a natural end or those choosing to migrate away for a number of reasons. Chris’s main issue was one of time. He was very involved with over-seeing every aspect of his business and took a very hands-on approach with each of his clients. This was vital to ensure that the service being provided was as good as it could be but it left no time for sales of any sort. Chris also had a limited budget to attract new customers and didn’t know how best to use that for maximum effect. He researched leaflet drops, telemarketing, newspaper and magazine advertising, radio advertising, networking and exhibitions. His research served only to confuse him even more although he quickly realised that radio advertising was prohibitively expensive. He also considered employing a contract manager in order for him to free up some of his time to promote the company. 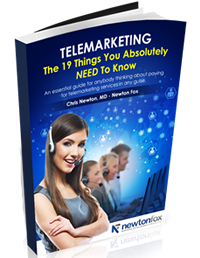 It was around this time that Chris had an approach form Chris Newton, MD of a specialist telemarketing company called Newton Fox. After an initial chat on the phone CK (as we’ll refer to him from now on) agreed to meet with CN and go through the options. CK was first struck by how un-sales like CN was in that he wasn’t automatically trying to sell telemarketing as his only option. CN had evidence from various sources on the effectiveness of leaflet drops, e-mail marketing, direct mail and several other options. CN put together an action plan for the business that saw significant but not over ambitious growth over a three year period. The plan required investment of time and money with many elements being the responsibility of CK and his team. This plan reflected the needs of the business in terms of growth and client acquisition and incorporated CK’s wishes regards the location, size and industry sector desired. Newton Fox then started the telesales campaign using the script developed in conjunction with First Impressions which helped highlight and identify the USP’s of the business to create a potent sales message. By incorporating timed offers, calls to action and effective e-mail follow up techniques the appointments soon started to appear. The next step was for CK to continue what Newton Fox had started and visit these companies to continue the sales message and go on to win the business. CK expressed his concern and lack of experience regards actually pitching for the business and so CN accompanied him on a couple of occasions o help cement the process in CK’s mind. CN devised a simple questionnaire for CK to run through with the prospect which shaped the visit in such a way that a successful outcome was difficult to avoid! Newton Fox worked for one day per week making cold and follow up calls on behalf of the business. Appointments were made with those businesses expressing concern for a number of reasons with their current providers. CK’s reputation was now growing and his passion and enthusiasm carried the business forward to new levels each month. As well as making appointments Newton Fox also made notes on where all the businesses using competitors were based, gathering all relevant intelligence such as renewal dates, contact details and so on to build a comprehensive and detailed picture of where the potential business lay for the future. Plotting this landscape is essential if a cleaning business is to flourish as this information, used correctly, can add very real value a business. Since engaging Newton Fox’s services the business has grown year on year. The terms of engagement are flexible and designed to suit the changing requirements of the business from month to month, season to season. As well as telemarketing Newton Fox have actively worked with First Impressions to continuously assess, refine and adapt the strategy wherever necessary to incorporate other sales initiatives including e-marketing, direct mailshots, networking strategy and several others. First Impressions is a successful business due to many reasons; not least of which is the way I which Chris Kay and his management team run the business. Passion, commitment and sheer hard work are all contributory factors. The cleaning industry is not a glamorous one but done well can provide many benefits including financial. Newton Fox have helped First Impressions make that difficult but crucial step from small, owner managed business to successful medium sized enterprise and continues to support this growth to the next level.